Research – Gina C. Torino, Ph.D. According to the Social Sciences Citation Index, as of March 2018, the article "received enough citations to be in the top 1% of cited articles in Psychiatry/Psychology." It has been cited over 2,900 times according to Google Scholar, a measure of its exceptional impact across the social sciences. Please visit this site for more information. research, and practice. Journal of Ethnic and Cultural Diversity in Social Work. and Gender. Thousand Oaks, CA: Sage Publications. A multidisciplinary reader. New York, NY: New York University Press. cultural competence. Special Issue of Women and Therapy: Whiteness and White Privilege, 38, 295-307. Torino, G. C., & Capodilupo, C. M. (2013). Instructor’s manual: Counseling the Culturally Diverse, 6th Ed. and Mental Disorders (pp. 177-191). Santa Barbara, CA: Praeger. Teaching Multicultural Counseling Classes and Infusing Cultural Diversity into Core Classes. Cultural Diversity into Core Classes. American Counseling Association. Cultural School Psychology. New York: Springer. Sue, D. W., Capodilupo, C. M., Torino, G. C., Bucceri, J. M., Esquilin, M. E., Holder, A. M., Nadal, K.
L., & Esquilin, M. (2007). 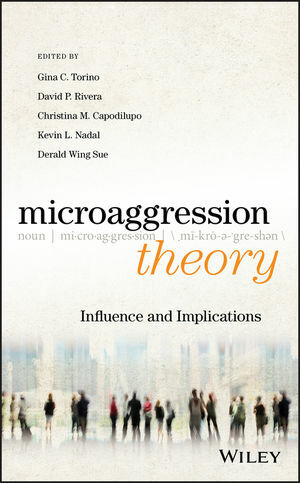 Racial microaggressions in everyday life: Implications for clinical practice. Sue, D. W., & Torino, G. C. (2005). Racial cultural competence: Awareness, knowledge, and skills. 21). Hoboken, NJ: John Wiley & Sons.